The United States is sanctioning ten companies and six individuals in China and Russia for their ties to North Korea’s weapons program, the latest move to put pressure on Pyongyang to abandon its weapons program. 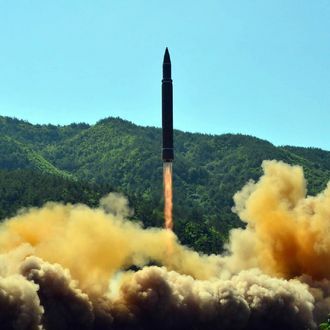 According to the Washington Post, these sanctions target Chinese entities that have traded energy or mineral resources, provided banking services to North Korea, or that have hired North Korean foreign laborers, whose incomes the U.S. alleges help finance Pyongyang’s missile tests. At least one Russian company and four Russian nationals were also targeted in the crackdown. “It is unacceptable for individuals and companies in China, Russia, and elsewhere to enable North Korea to generate income used to develop weapons of mass destruction and destabilize the region,” Treasury Secretary Steven Mnuchin said Tuesday in a statement. Mnuchin added that these actions were “consistent with U.N. sanctions,” referring to harsh sanctions against North Korea approved by the United Nations Security Council last month. China and Russia crucially joined the Security Council in unanimously voting for those measures, which United Nations ambassador Nikki Haley called “the most stringent set of sanctions on any country in a generation.” The backing of Beijing and Moscow — both with Security Council veto powers — appeared to be a substantial international victory and maybe a step toward getting all sides to the negotiating table, though North Korea responded by retaliating against the United States, and by promising to never give up its weapons. The U.S. also previously slapped sanctions on a Chinese bank, one other company, and two people in late June — shortly after the death of North Korean prisoner and UVA student Otto Warmbier — also for those institutions’ and individuals’ links to Pyongyang’s accelerating nuclear-weapons program. China is North Korea’s main trading partner, and the Trump administration has criticized Beijing for not using this economic leverage to pressure Kim Jong-un. China, on the other hand, sees Washington’s saber rattling as the real problem, leaving the two powers at cross-purposes.